The information in this article introduces you to the concept of using the Records Center to manage and store your records. You will find general guidance information in this article to help you understand the benefits of using the Records Center site template. For more detailed information on creating and using the Records Center, see the links under See Also. The Records Center is intended to serve as a central repository in which an organization can store and manage all of its records such as legal or financial documents. The Records Center supports the entire records management process, from records collection through records management to records disposition. Typically, a Records Center site is designed and configured by an organization's records management professionals and information technology (IT) staff to support an organization's file plan. Note: SharePoint provides the ability to manage records “in place.” With in-place records management, you can use any feature available in the Records Center, such as information management policy enforcement, routing, and hold, to manage records on any site. To learn more about in place records management, see the links under See Also. Records are never automatically modified by the system. This ensures that records that are uploaded to a Records Center site and then downloaded again later are always identical. Site administrators can configure the Records Center to prevent the direct tampering with records. This is done by versioning any changes that are made to the document and by auditing specific types of changes. The Records Center allows records managers to add and maintain metadata on items separately from a record's metadata, so that the information that is pertinent to records management tasks can be updated without modifying the underlying record. Changes to metadata are also versioned. Auditing This feature logs events and operations that are performed on files. Auditing is useful to record whm is viewing and accessing information in the Records Center. Expiration This feature specifies how long a record should be retained and what action should occur when the retention period ends, such as deletion or the initiation of a Disposition Approval workflow. The retention period for a record usually begins when a record is initially submitted to the Records Center. Barcodes This feature provides each record with a unique barcode image and numeric value. The value of the barcode is stored and indexed along with the electronic version of the record. Barcodes are useful for retaining and tracking physical records. When the records in a library have physical versions, barcodes provide a way to correlate the physical versions with their electronic counterparts. Record collection programmable interface The Records Center supports a set of services that facilitate records collection. The Records Center's programmable interface enables organizations to configure both document management and e-mail systems to automatically submit files to the Records Center site. Content can be submitted to the Records Center through a Web service by using the SOAP (Simple Object Access Protocol) or through e-mail by using the SMTP (Simple Mail Transfer Protocol). 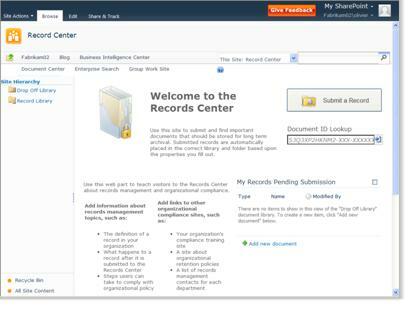 You can also use workflows designed in Microsoft SharePoint Designer 2010 to submit records to the Records Center. To learn more about submitting records to the Records Center, see the links under See Also. Record routing The Records Center includes a Content Organizer that can automatically route incoming records (whether submitted automatically or manually) to their proper location, based on their record type. When a record is submitted to the Records Center, it is often accompanied by additional related information, such as audit history and metadata. A record's audit history is stored in the Records Center as an XML file, and a record's metadata is stored both in an XML file and in metadata columns on the Records Center site. To learn about configuring and routing records using the Content Organizer, see the links under See Also. Hold As part of what is known as e-Discovery, the Records Center enables organizations to take records that are under legal discovery as part of litigation, or relevant to an audit or investigation, and place them on a Holds list. When records are placed on a hold, they are suspended from any expiration policies that may be in effect, and they are thus protected from destruction. For example, if in the event of litigation, an organization places relevant records that it may be required to produce on hold, these records are available until the litigation is complete. Records can be placed on more than one hold at a time. Records managers can also search the Records Center for records that need to be placed on hold. For more information on e-Discovery, see the links under See Also. Companies are often required to generate and provide financial reports on a regular basis for tax purposes. At any point, a company might be requested to release financial information as part of an audit process, for example, and financial information must be released with the requirement that the data is not altered in any way. To accommodate this request, the company’s financial department searches for and routes the financial reports to a specific Hold library within a Records Center site. By sending reports to a Hold library, they are suspended from any predefined policies that might be in effect and access to these reports is blocked until a specific date and time or until the proper authorization occurs. The financial reports are saved to the Records Center site along with the associated audit history and other metadata. An organization must develop a records management strategy and a formal records management plan. This is a collaborative effort that involves coordination among records managers, compliance officers, IT professionals, and information workers. An organization must then configure one or more Records Center sites to implement its records management plan. The sections below outline the primary elements involved in each of these steps. File plan A file plan describes the types of documents or items that an organization acknowledges as official business records. It indicates where these records are stored, and it provides information that differentiates one type of record from another. The file plan serves as a comprehensive collection of policies, processes, and guidelines for creating, storing, and managing records. A file plan should cover all records, regardless of media, including paper, blogs, wikis, e-mail, and electronic files. It must also specify how each record is classified, secured, and ultimately destroyed. It should also include considerations for special categories of records, such as Confidential, Vital, Trade Secret, or Privileged records. Finally, a file plan must specify the people who are responsible for managing each type of record. Record Libraries Record libraries are essentially document libraries that you create to classify and store important records. You create a record library for each type of record you want to retain. Records are automatically routed to the appropriate library based on the settings configured in the Content Organizer. Content types You create content types to define the types of records your organization needs to store and identify any unique properties for each type of record. By defining content types for specific kinds of records, your organization can ensure that each of these groups of content is managed in a consistent way. Office documents, PDFs, TIFFs (scanned images), e-mail, instant message conversations, videos, and physical records can all be classified and stored with the content types you create. Any record called a “contract,” for example, will be treated the same way and in a consistent manner within SharePoint’s records management system. Using content types to classify and store records is an alternative method to using record libraries. Retention schedule A retention schedule specifies how long each record type in the file plan must be retained (its retention period) and the process for disposing of it when it reaches the end of this period (its disposition process). The guidelines in a retention schedule are usually based on legal requirements, risks to the organization, and business need. Additionally, a retention schedule usually describes the risk management contingencies that determine the retention period for each record type. Compliance requirements document A compliance requirements document defines the rules to which IT systems for records management must adhere, the capabilities they must have, and the kinds of regular monitoring they must support in order to ensure compliance. Formal process for suspending the disposition of records This process, which is often called a hold, details how an organization suspends the disposition of records when events such as litigation, audits, or investigations occur. System for monitoring and reporting the handling of records To ensure that employees are filing, accessing, and managing records according to defined policies and processes, a records management program must have a process or system for monitoring and reporting on the handling of records. Note: As with any other site, you can manually upload files up to 2 GB in size to the Records Center. If you use the Content Organizer to route records to the Records Center, the file size limit for each record is 50MB. For more detailed information about planning your records management solution, see the links under See Also. After an organization engages in detailed planning of records management and develops a formal plan for records management, it can create and configure a Records Center site to help it implement this program. Create record libraries or lists to manage and store each type of record that is specified in the file plan. We recommend that you create one record library for each content type in your records plan. When records are submitted to the Records Center, they are routed to the relevant list or library. Create columns for the relevant document libraries, lists, or content types to contain and display the metadata for each record type that is specified in the file plan. Specify the information management policies for each record type on the Records Center site. These policies should reflect the retention periods and auditing requirements that are specified in your organization's file plan and retention schedule. Configure the Content Organizer to route each record type to the appropriate location. When records are submitted to the Records Center site, either manually or programmatically, the application uses this feature to determine how to classify the record within the Records Center site and where to send it. For more detailed information on configuring and customizing your records management solution, see the links under See Also.